Pay it forward and leave a painted rock for a teacher in your community. Painted rocks are showing up all over the country as a way to pay it forward to unsuspecting stranger. The concept is simple—paint a rock with a fun or inspirational message, and then leave it at a public park, nature space, or neighborhood spot for someone else to find. It’s like a mix of Hide-and-Seek, Goe-Caching, and a treasure hunt. We decided to put a teacher spin on the painted rock trend, so we came up with these fun designs and suggested teacher-appreciation sayings. Take a look at these 15 rocks with tips on how to recreate them on your own. 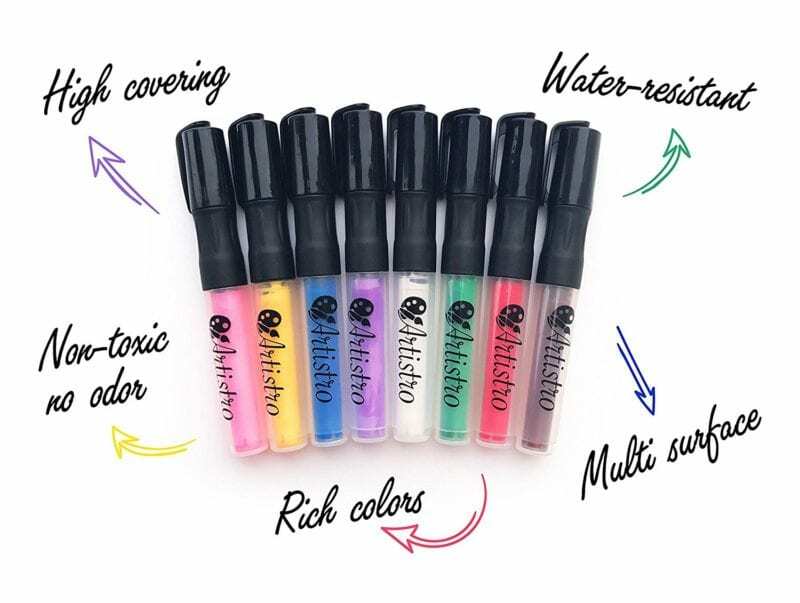 Here are the markers we used, which you can pick up on Amazon (affiliate link). You can also buy any other acrylic paint markers like this Sharpie brand or others you like. Be sure to look for ones that are water-resistant! In the digital age, painted rocks seem more Pony Express than Twitter worthy. But a painted emoji with clever text can make any teacher smile. Here’s a hint—any cup makes a great circle template! Yes teachers DO rock! Sometimes on the way into school; radio at full blast with that song that sets up the morning energy just right. But we also pull long hours, work at home, and answer the call at the grocery store or during bedtime when someone else’s kiddo needs us, too. The weight of this rock drastically understates how true this statement is. Just add a white background and blue lines for that notebook appeal. That wise sage of education also comes with an adorably easy paint scheme. Make some eyes, a nose, and then add some sloppy lower-case letter Us to your design, and voilà! Who’s the artist? You the artist! Imagine a rock. Now visualize a yellow painted ruler. Uh-huh, you just used good listening skills and a creative imagination. At some point a teacher helped craft that within you! Draw a rectangle ruler, add lines to sell-it, and add the right saying. Perhaps a certain yellow-faced cartoon said it best…”Donuts! Is there anything they can’t do? !” I know I’d love finding one of these! And with sprinkles!! Make a circle, make a center, and decorate. I hope a painted apple rock sitting on a teacher’s windowsill will bring a smile to their face during a long day. We don’t go into teaching for a return investment on care and dedication. But I have always appreciated the thanks I received and cherish every special trinket lovingly crafted by student hands. This heart and message says it all. Decorate with contrasting circles of color to really bring the love. Not just amazing but wonderful! That pretty much sums up teachers, so celebrate the strong ones in your life with the simple “WW” symbol and message. You can always accent the edge with a lasso-of truth! Suggested message: Teachers are superheroes. No matter what your class size or age, every teacher feels like they fight off kryptonite assessments all for the glory of students loving to learn. And when you need an ace up your sleeve, this super reminder can get you or a colleague through any tough afternoon. A simple logo is all you need. I encourage you to find this, or any other favorite hero to instill the power you need to finish the day strong! Suggested message: I Teach. What’s your super power? When all hope is lost, be the light that illuminates the path to enlightenment, and inspire the change we need! Just draw a pear shape, grey the bottom, and yellow the middle to brighten someone else’s day! The best thing about painted rocks is that you can make them anything you want. Pick your school’s logo or write a personal message. I took the WeAreTeachers logo and recreated it on a rock, but let your imagination go wild! While some of these designs might be a little advanced for my K5 students, I can’t wait to paint rocks with them this school year, and I Hope these inspire you to do the same. Art doesn’t have to be your forte. Use student inspired ideas, images and messages to create unique treasures and positive messages to help you and anyone around you feel the support and love they need!